Article first published as TV Review: THE GIFTED on Seat42F. With the glut of superhero programming, do we need another series featuring people with powers? DC is dominating on the CW, less so on FOX, while Marvel has solid offerings on Netflix and inferior ones on ABC. The newest entry, THE GIFTED, is the second X-Men show in a year (technically Marvel via the comics, but not part of Marvel Studios), and proves that mutants still have something interesting and fresh to say. It’s not as trippy and unique as Legion, FX’s X-Men program, but it is still very worthwhile. 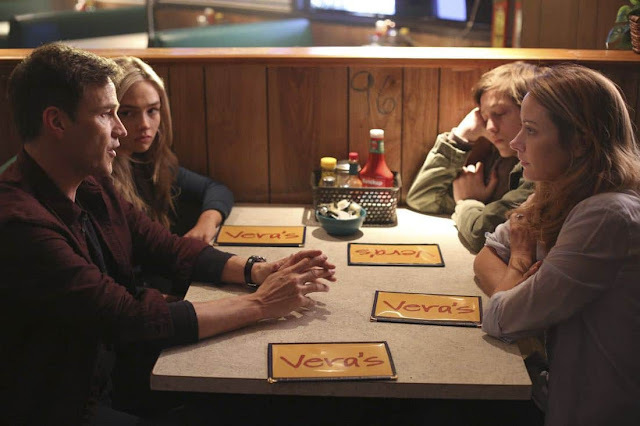 THE GIFTED is centered on the Strucker family. Patriarch Reed (Stephen Moyer, True Blood) helps capture mutants, though he insists only those who have broken the law. But when his own children, Lauren (Natalie Alyn Lind, The Goldbergs) and Andy (Percy Hynes White, The Grand Seduction), violently exhibit abilities, he doesn’t hesitate to join with wife Kate (Amy Acker, Person of Interest) in taking the clan on the run. Separately, we meet a group of mutants in hiding led by Lorna Dane / Polaris (Emma Dumont, Bunheads). The daughter of Magneto, she has stepped up when both the X-Men and the Brotherhood disappeared. (Where they went is a mystery.) She is joined by Marcos Diaz / Eclipse (Sean Teale, Reign), John Proudstar / Thunderbird (Blair Redford, Satisfaction), and Clarice Fong / Blink (Jamie Chung, Once Upon a Time) in helping others who manifest more-than-human traits stay ahead of the evil Sentinel Service that pursues them, personified in Jace Turner (Coby Bell, The Game). THE GIFTED is very ambitious, but it also has a lot going for it. By stating up front that the X-Men and the Brotherhood are gone, viewers won’t be waiting for the more-famous characters like Professor X, Cyclops, Magneto, Wolverine, and the rest to show up. It’s clear that this cast are our heroes, and that’s how it’ll likely stay. The X-Men film franchise has always been shaky on continuity, so THE GIFTED isn’t tied to anything else going on in other mediums, designed to stand on its own. Without the restrictions of movies and super familiar personalities to adhere to (some will know these characters, but not nearly as many as who know the X-Men themselves), it has the freedom to do something different. Some are likening this show’s premise to an Underground Railroad situation. The mutants are a persecuted class, fleeing from people who fear or hate them. They have to operate in secret, and move a lot to stay ahead of those who would do them harm. Most haven’t actually done anything wrong, attacked for who they are, not their actions. The diverse cast modernizes the story, but the parallels are still obvious. THE GIFTED is also a family show. We see the pain and suffering of parents Reed and Kate, and their love and dedication to their children. Reed, especially, is expected to question if he should be protecting Andy and Lauren, but he doesn’t. His job as their father wins out over his profession. But without powers himself, is he up to the task of protecting them? Will he have to learn to accept that his kids can keep him safe more than the other way around? And what is his role in the family then? Kate is less developed in the pilot, but I assume she will face similar issues. This series is smartly written, well-acted, and with pleasing special effects, among the best the usually-lazy broadcast networks have to offer, feeling more like cable programming. It embraces the comic book world it hails from, but isn’t defined by it, making a dark drama full of social commentary that stands on its own. I didn’t expect such a high quality from creator Matt Nix, formerly of Burn Notice, but he has definitely grown into his role as a respected showrunner, and I’m excited to see where he takes things from here. THE GIFTED premieres Monday, October 2nd at 9PM ET on FOX.